We recently discovered a brand of All Natural Bones for Dogs that we just have to share with you because Bentley absolutely loves them! 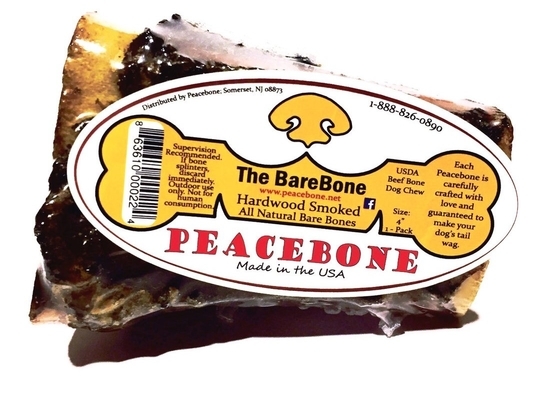 Peacebone is a company that creates a healthy option of dog treats. Each dog bone is hand picked and made with the finest USA farm raised beef sourced from local farms. Peacebone's founder James Hencken's vision is to create dog treats that aren't mass produced in mills or overseas where regulations are nearly nonexistent but to produce them in the USA using only quality ingredients. Having some experience farming, James was able to find top quality and responsible farms that do not use antibiotics, GMOs, or any abusive measures towards their animals as well as being free range and that take good care of their animals. "We set out to make our own bones for our own dogs that were of a higher quality than what we were able to find on the market. We succeeded. 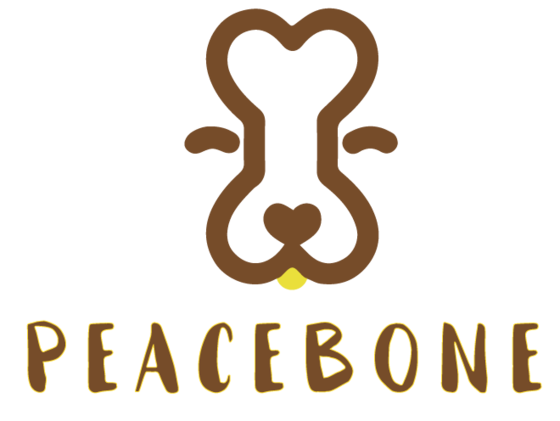 Peacebone was born through our desire to fill this demand for our fellow dog lovers; to offer this quality to our friends and loved ones, and now, on to you." Read below to find out how all three different Peacebones stood up to the jaws and the palate of Bentley the Pit Bull and her friend Baguette the Frenchie. First up to the challenge is the Bare Bone. This is their medium sized bone which is 4-6 inches long and filled with marrow. It is slow roasted and smoked to perfection and the perfect size for Bentley to munch on all day. The next bone we tried out was The Pacifier which is a bit smaller and "rounder" than the Bare Bone. It is actually a knee cap that has been slow roasted and hand trimmed. This particular bone has pieces falling off of it that are delightfully crispy and it actually smells pretty good in my opinion. On the actual packaging it states that "Each Peacebone is carefully crafted with love and guaranteed to make your dog's tail wag" and yes it does what it claims because the dog's tails were wagging! This bone was actually hi-jacked by another dog. Funny story, we are curently dog sitting a French Bulldog named Baguette and let me tell you, this guy was all about this bone. He managed to take it away from Bentley and has been spending everyday gnawing at this thing. It's been almost a week and he's still going at it and enjoying every second of it as he licks and bites away in between his cute little Frenchie snorts. This one is definitely a hit for the little guy. The last bone but surely not the least or the smallest is The Peacemaker and this bone doesn't disappoint. It is the largest bone at 7-9 inches long and is the perfect size for a large dog to tote around in his or her mouth which is exactly what Bentley has been doing. This bone is actually a hind leg so imagine that. As soon as I showed Bentley this huge bone her eyes widened and she did that ancy dance dogs do when they are excited and anxious. It's when they lift up their paws and step down over and over in anticipation. Dog owners should know exactly what I'm talking about. Well you could tell that she was super excited about this bone. When I gave it to her she was over the moon and carried this thing around in her mouth like it was a prize. She didn't want to put it down, she just pranced around the backyard with the bone, happy as a clam. As a matter of fact, every time I go into the backyard she runs to her bone just so she can carry it around in her mouth like a proud mother. It's quite endearing. It seems that both of the dogs loved the bones and so do I because they are not only affordable an long lasting but they help sustainable farms and are a healthier alternative than many other bones on the market because they were created with the dog and owner in mind. I will be getting more bones for Bentley to enjoy and I feel great about the fact that the animals used are treated without the use of antibiotics and with no harm done to the animals. "We believe that, just like people, active dogs are healthy dogs. We are avid hikers, campers, and all around outdoorsy people. We aim to connect with our fellow nature enthusiasts, and we believe our products are the best option for those fixated on hitting the trails happy and healthy. Therefore, the products we are focusing on are developed to support this lifestyle. Our bones are the best campsite reward possible, and our easy to pack, freeze dried Trail Treats will give your dog the protection and nutrients they need to keep going. So deeply do we care for our environment that we include Fur seeds in EVERY order we ship, so that while you're hiking with your dog, you can plant a tree!" We were lucky enough to score a discount code for all of you lovely readers. You can get 20% off your order of Peacebone treats by using code: mypitbullfriend20 at checkout!